I got the idea to go to Singapore after chatting with a Singaporean exchange student at a “get-to-know-you” brunch earlier this semester. Singapore, being so small, had slipped my mind when it came to planning weekend trips. But as soon as I was reminded of its existence, I knew I had to go. I asked Michael if he’d want to tag along, and we booked our tickets that week. Singapore is an independent island city-state that broke off from Malaysia over 50 years ago. Whereas Hong Kong is a city surrounded by less-populated nature to the north, Singapore is just a jam-packed city, making it’s the third densest country or territory in the world. I’ve now visited three of the top four (Macau, Singapore and Hong Kong), which is pretty cool. With 82 skyscrapers, it has the 12th-most of any city, and it is in many ways a city of the future. Tech companies like Google and Ubisoft have offices there, and the architecture is the most unique and stunning of any city I’ve visited. Maybe the most interesting aspect of Singapore is that the primary language is English. In Hong Kong, signs that aren’t government official may or may not be in English, depending on the target audience. But in Singapore, you can count on almost everything being in English. Other possible languages include Malay, Chinese and another language that looks similar to Malay but that I can’t identify. Important signs in Singapore are in these four languages, with English first. This made travel a breeze. After we landed on Friday, we took the subway system, called the MRT, a couple stops to our hostel and were immediately greeted with some hot, thick air. I hadn’t paid much attention to Singapore’s location on the world map before we went, and the more-south-than-west trajectory put us less than 90 miles from the equator. That’s practically no distance at all considering the size of the world. For reference, the closest I had ever previously been was Hong Kong at roughly 1500 miles from the equator (Key West, Florida is about 1700 miles away, for further reference). What I’m trying to say is that it was extremely hot and humid, even in March. The weather was a level of mugginess I didn’t know existed, and it was the most uncomfortable climate I’ve experienced. The base temperature ranged from 80-90, but the “Real Feel” temperature with humidity factored in was over 100 degrees Fahrenheit each day, and it gets far hotter in the summer. Anyway, we dropped our stuff at the hostel, grabbed a quick snack of fast food curry puffs and Vietnamese iced coffee with soy, then headed to Little India. Indians make up about 10% of Singapore’s population, making it a haven for Indian food and culture. I’ve never been to India, of course, but the district looked and felt exactly how I’d expect a city in India would. After walking the streets for a while, we ducked into a museum on Indian culture, which told the story of Indian migration and integration into Singapore. Unlike most history museums, the majority of the “artifacts” are less than a hundred years old, given Singapore’s short history. We stopped at a highly-rated Indian restaurant for dinner, which I think was my first experience with authentic Indian food. I’m hooked. I ordered chicken biryani rice and a side of garlic naan, both of which were fantastic. Spicy, yes, but delicious. Now, I’m going to take a second and be extra real with you all. Off the places I’ve been, Singapore has the most diversity in food, which is great. But for the first time in my travels, it upset my stomach in a terrible way. In an attempt to save space in my backpack, I didn’t bother to bring any medicine, despite the fact that Indian food has a reputation of sorts. To make matters worse, you never know what you’re going to get in a Singaporean bathroom. Well-equipped ones contain toilets capable of flushing toilet paper. Others toilets have only a sprayer hose that looks like the one on your sink. No paper. Then there are the “squatty potties,” where you grab the handrails, squat above a hole in the ground, and hope for the best. Let’s just say that trying to find a familiar commode for a “powerful movement” was a struggle that evening. We’ll just leave it at that. Anyhow, we ended the evening by going downtown to the Gardens by the Bay, a huge complex of giant illuminated metal trees with greenery growing up the “trunks.” That’s a horrible explanation, but the area is difficult to describe. The structures were surreal; walking through them felt like being on Pandora from Avatar. I think it’s a statement on the symbiosis of a modern city with nature, aside from being a tourist attraction. In any case, it’s beautiful. The complex also has fancy bio-domes filled with plants, but entry was expensive, so we skipped those. Just outside the Gardens, we happened to catch the evening’s waterfront show, which combined lights, music and powerful waterspouts. It was fun to watch and provided some great photos. Saturday, we visited National Gallery Singapore, a large art museum in Singapore’s old parliament building. I’m usually not interested in art, but I did enjoy this gallery. It was the first art museum I’ve been to, and much of the art tied to history, politics, and other relatable topics. I wasn’t simply looking at impressionist or abstract paintings; I was looking at the outcomes of various social movements and events immortalized through art. The muesum’s framing really helped me comprehend what I was seeing. After the museum, we went to the Singapore Botanic Gardens, one of only three gardens in the world to be listed as a UNESCO World Heritage Site. It was absolutely phenomenal, to say the least. The gardens were beautifully designed, well-kept and biologically diverse. The gardens were split into several sections, and I know we must have glossed over some because of how expansive the grounds were. From delicate orchids to massive trees, it was an oddly serene experience that made me forget I was still in a busy metropolis. But all the tropical plants I’m unfamiliar with reminded me I’m in Asia. While I’ve been to botanic gardens before in the US, this was a totally new experience. That evening, we visited Chinatown, did some souvenir shopping, bought some fresh juices, and ate dinner at a delicious Chinese restaurant before heading back to the hostel for some rest. Sunday, we went to a record store where I managed to find a copy of the one record I wanted during Record Store Day 2017: a copy of “Strawberry Fields Forever” and “Penny Lane” by The Beatles that was limited to only 7,000 copies worldwide. I was driving to a concert last RSD, and by the time I went to my local record store that weekend, it had sold all its copies. But this Singaporean store’s order came in two weeks late, and the RSD craze had already died down by the time the package arrived. That misfortune was my saving grace, and I couldn’t have been more pleasantly surprised. Who knew I’d find a copy on the other side of the globe? After that, we walked a trail along Singapore’s southwestern coast, where we saw remnants of a WWII bunker and an MG nest. I never realized fighting took place in Singapore during the war, and it’s the first WWII site I’ve ever been to. After the walk, we headed back to the hostel before dinner. On that note, it’s good to have connections. Last academic year, a Singaporean exchange student practiced with our kendo club during his time at Ohio University, so I reached out to him while in Singapore. Luckily, he was able to meet us for dinner Sunday night and took us to a Malaysian restaurant that specializes in bak kut teh, a delicious soup made by cooking pork ribs in peppered broth. After dinner, he showed us around town and pointed out places like one of Singapore’s historic fire department buildings, an outdoor restaurant complex built around an old cathedral, and a cluster of sports bars and restaurants alongside the Singapore River, all of which looked beautiful at night. My local friend told us that we should go see Singapore’s famous Merlion before leaving, which we did the next day. Legend has it that when Western explorers landed at Singapore for the first time, they saw a lion on the island. They decided to name the port after the lion, which is “singha” in several languages. Thus the name Singapore was born. The Merlion is a giant stone statue of a lion and mermaid, which I suppose combines the lion with the sea surrounding the island. 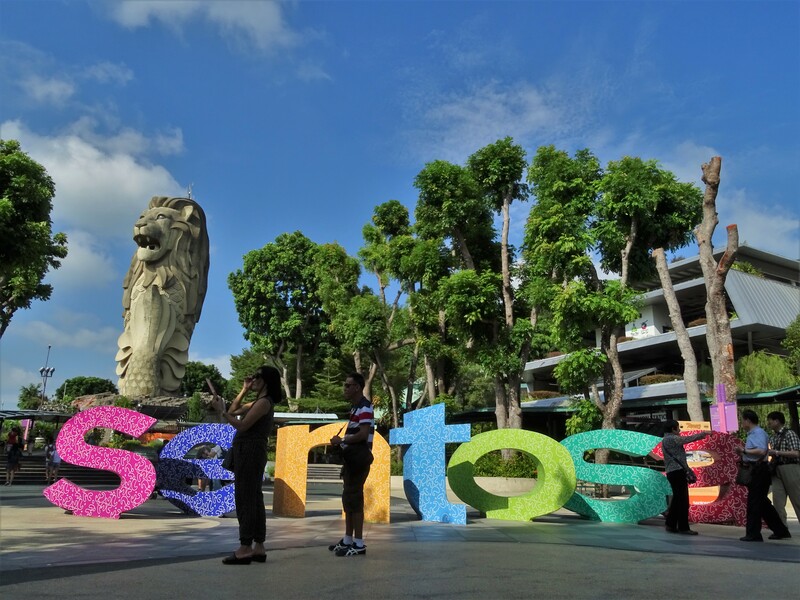 In any case, the Merlion is on Sentosa, a small resort island that also belongs to Singapore, and we stopped by early before the heat and crowds set in. Extremely touristy? Yes. Odd and unique? Also yes, so I’d say it was worth it. After that, we made our way to the airport and flew back to Hong Kong. Overall, the trip was fantastic, toilet situation and intense heat aside. The food is delicious and diverse, the architecture is out of this world, the attractions are extravagant, and it’s all easy for English speakers to navigate. Plus, I got to catch up with a friend and do things I’ve never done before, like go to an art museum and eat Chicken McNuggets with curry sauce (yes, that happened). Because the climate made going outdoors uncomfortable, I can’t say I’d want to live there, but it was certainly an awesome place to visit. I’d do it again for the food alone, to be honest, and it was a weekend well spent. I’ll be there in a few weeks. Can’t wait! And Hong Kong too. Enjoy it! They’re amazing cities! Be sure to bring both sunscreen and an umbrella; it’ll be the rainy season, but when it’s not raining, it’ll be pretty hot haha.